Apply by April 10 for the chance to win $125,000! Only a few days remain to apply for the 2015 SAFE Energy Security Prize, which recognizes promising oil-saving technologies with a total of $175,000 in cash awards. The Prize is designed to support the critical efforts of companies, institutions, and individuals whose innovations are poised to advance American energy security by helping to end U.S. oil dependence. Prospective candidates should submit their applications no later than Friday, April 10. Applicants can learn more about the Prize and how to apply by visiting www.secureenergy.org/prize. Please help us find and support the next generation of oil-displacing technologies by sharing this announcement with your networks and joining the conversation on Twitter by using @Securing_Energy and the hashtag #SAFEprize. 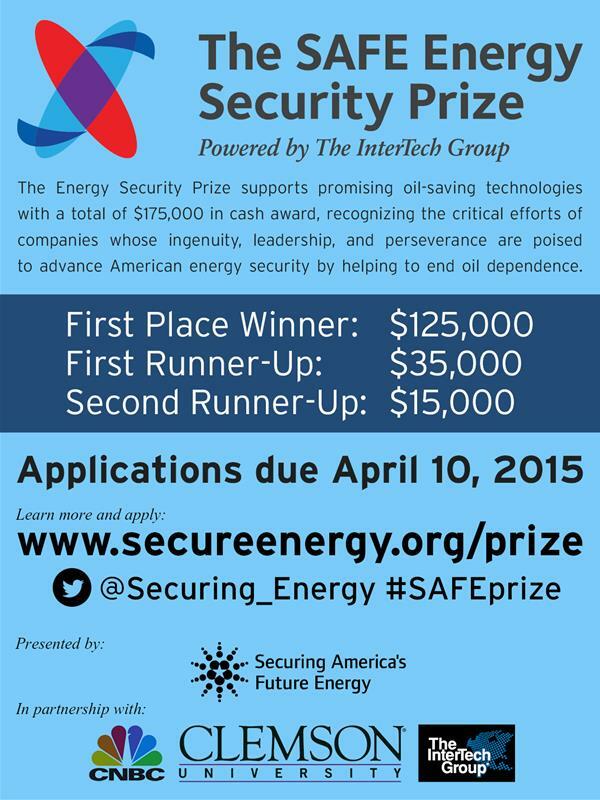 The 2015 SAFE Energy Security Prize is supported by the InterTech Group, Clemson University, and CNBC. In addition to awarding critical funding, SAFE and these world-class partners hope to provide applicants with a national stage to promote their product and attract future investment. This year’s winner will receive $125,000. The first runner-up will receive $35,000, and the second runner-up will receive $15,000. The 2015 SAFE Energy Security Prize is powered by the InterTech Group in memory of its founder, Jerry Zucker. Mr. Zucker was an inventor, scientist, and businessman, driven by a life-long passion to create technologies that could revolutionize the world and improve the health of our country. Solving our country’s oil dependence will require the best of America’s innovative spirit. Please share the Prize with your friends, colleagues, and networks, and join SAFE in finding the technologies we need to improve U.S. energy security. SAFE is an action-oriented, nonpartisan organization committed to combating the economic and national security threats posed by America’s dependence on oil. Find out more about SAFE by visiting www.secureenergy.org.